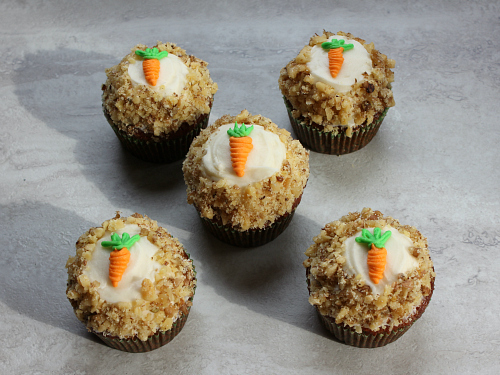 over easter weekend, we made carrot cake cupcakes for easter sunday dessert. i guess we sure got a good dose of beta-carotene this weekend between our carrot cake pancakes (seen here) and our carrot cake cupcakes! for me, carrot cake is synonymous with easter. 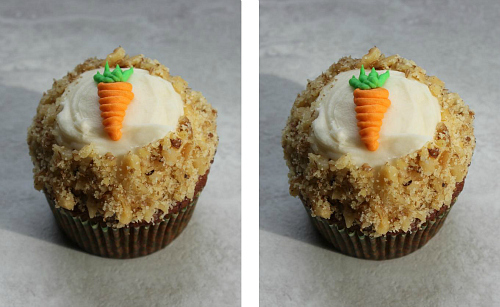 these carrot cake cupcakes are full of carrots. they get their great flavor from the carrots, walnuts, coconut, and pineapple. ground cinnamon gives them the perfect amount of spice too. 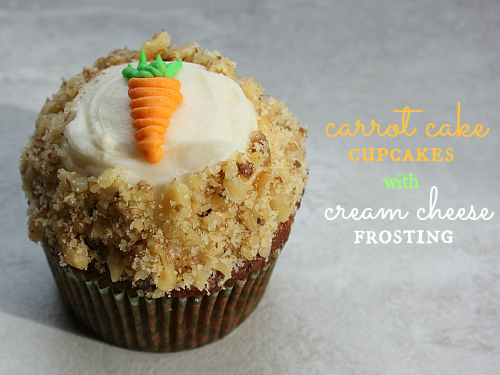 carrot cake cupcakes are made to be topped off with cream cheese frosting. the cupcakes themselves are not very sweet, so the sweet cream cheese frosting is the perfect compliment to them. 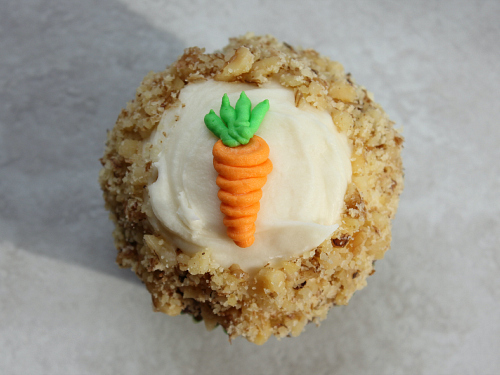 edged in crushed walnuts and decorated with a buttercream carrot, these cupcakes are super cute. you simply can't go wrong with a classic dessert like carrot cake! preheat your oven to 350 degrees F. line two muffin pans with 24 cupcake liners. to make the cupcakes, sift the flour, baking soda, and cinnamon into a large bowl. add the sugar, oil, eggs, and vanilla. beat well until combined. stir in the carrots, pineapple, coconut, and 1/2 cup of the walnuts. pour the batter into the prepared muffin pans. bake for 35-45 minutes, or until a knife inserted into the center of the cupcakes comes out clean. allow the cupcakes to cool completely before frosting. to make the frosting, beat the cream cheese and butter with an electric mixer until smooth. add the vanilla. gradually add the powdered sugar and beat until fluffy. spread the frosting over the cooled cupcakes and top with the additional 1/2 cup of chopped walnuts. store in the refrigerator until ready to serve. These look really good. You did a wonderful job on the carrot, too. I'd like to invite you to link up to my party, Manic Monday. Hope to see you there! Oh, looks delish. I secretly wish COSTCO would sale their carrot cupcakes individually instead of packs of 6!